For those of you who have been with me for awhile, I'm sure you're looking at the title of this post and are all like, "first Raclette, my hiney the first Raclette!" And you would be right, because heaven knows, I've been around the Raclette block more than once. But this post is about the first Raclette in Texas, ours anyway. It all started a couple of months before Christmas, when I knew that without a doubt, I'd be getting Gregory a Raclette for his present. It seemed like the perfect choice, December being prime Raclette season and all. Plus, it would bring Gregory a little bit of France to Texas, and I'm not going to lie, I wanted that little bit of cheesy France too... it was a win, win. As the holidays approached and Christmas meal plans came together, I decided that Gregory's opening of his Raclette grill on Christmas morning would only be the first part of his Christmas present, because the second part would be delicious Raclette for our Christmas dinner (I like to give the gift of food). My mother agreed (mostly because of the easy peasy nature of it all I'm sure) and that was that. Then early one morning, a couple of days before Christmas, I ever so gently lifted the duvet, and slipped out of bed as quietly as possible trying my best not to wake up Gregory, because if he stirred he'd ask, "where do you go Skippy" and I didn't want to have to make something up because he'd insist on going with me anyway, and he couldn't because I was making a super stealth trip to the grocery story for Raclette supplies. By 7:30, I was back home, wrapping meats and cheese in tin foil and hiding the delectable parcels at the bottom of the vegetable crisper because of course he wouldn't look there, and saying that the breakfast taco line at Mary's Tacos was so long and that's where I had been for the past hour. My cheesy plan was coming together and Gregory was none the wiser! Finally Christmas morning arrived and I was so excited and Gregory opened his present (which had been hiding at the back of the tree because Gregory cannot be trusted to not shake things and guess wildly) and then he was excited too and Fifty was excited because we were excited and we were all excited! And when I told Gregory that part two of his present was that we were having Raclette for Christmas dinner it was practically pandemonium! I was happy, Gregory was happy, my mother was happy (Raclette for Christmas dinner means she didn't have to cook again, and since we do our fancy pants Christmas dinner on Christmas Eve every year, we've decided that going forward, Christmas day will be all about Raclette... that grill is the gift that keeps on giving), and we were all so happy that we had Raclette, like three times, in one week. So technically this post could have been called, The First, Second, and Third Raclette. The end. What a wonderful story! 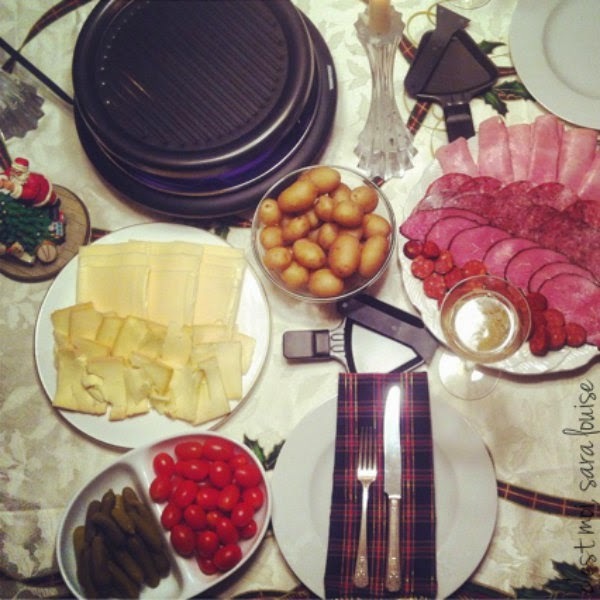 My daughter's New Year's Eve party dish was raclette (she is 23.) I have been eyeing raclette machines for 2 online now that the girls are out of the house...it is one of the most wonderful of France's culinary creations in my book! Ooh I love raclette! What a wonderful gift! Raclette is such a good choice for entertaining since the ratio between how impressed everyone is to the amount of effort it takes is excellent. I've got a similar idea for Valentine's Day this year - a mini Le Creuset fondue set (suuuuper cute and not as pricey as you'd think) and then fondue for dinner. Only concern is whether it will hold enough fondue for our bellies! Great present! I love raclette. Especially on Christmas. We started having raclette on Christmas when I stopped eating meat as a kid. And vegan raclette is delicious. I love the way you told this story - and what a wonderful gift for Gregory to have. We've not had raclette for quite some time. That really should be rectified. You kind of give the best food surprises of all time. Make your way a few miles north please?? I've yet to have raclette. I NEED RACLETTE.